Beach Water Quality | Propel L.A. Wet weather conditions all year round (Heal the Bay, July 2017). 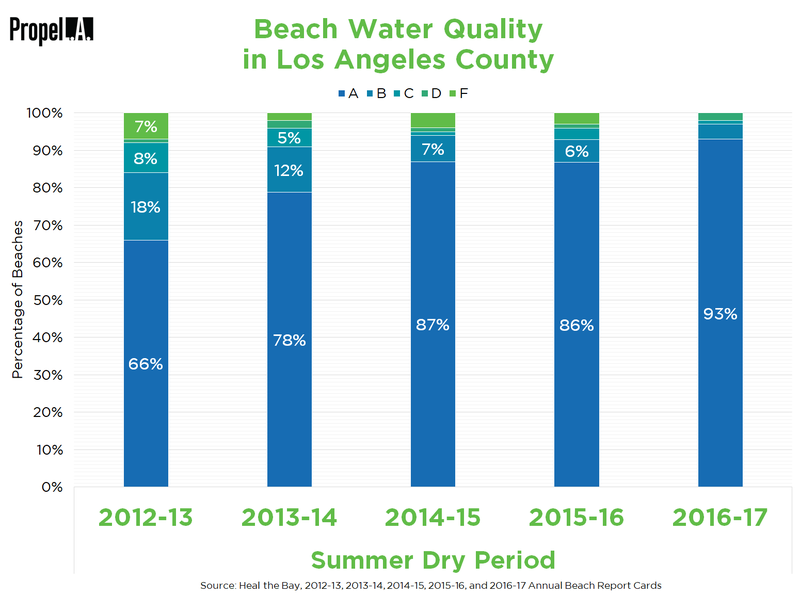 Historically, the quality of beach water in Los Angeles County fares well during dry periods but plummets in wet conditions. Summer dry has proven to be the best period with over 91% of beaches receiving A and B grades on average in the past five years. The grades during summer dry periods also consistently improved each year, peaking at 97% of beaches receiving A and B in the most recent 2016-17 Report. 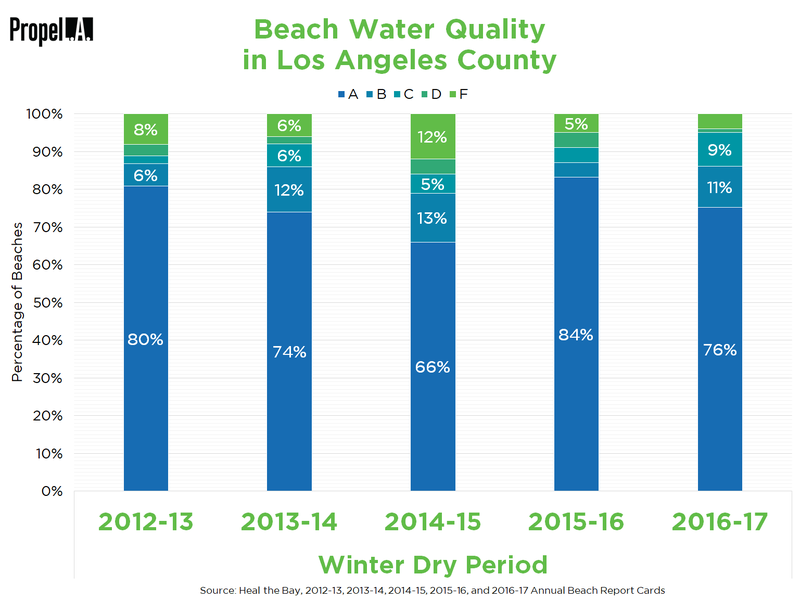 Another good period for beach water quality is winter dry, with over 85% of beaches receiving A and B grades on average in the past five years. 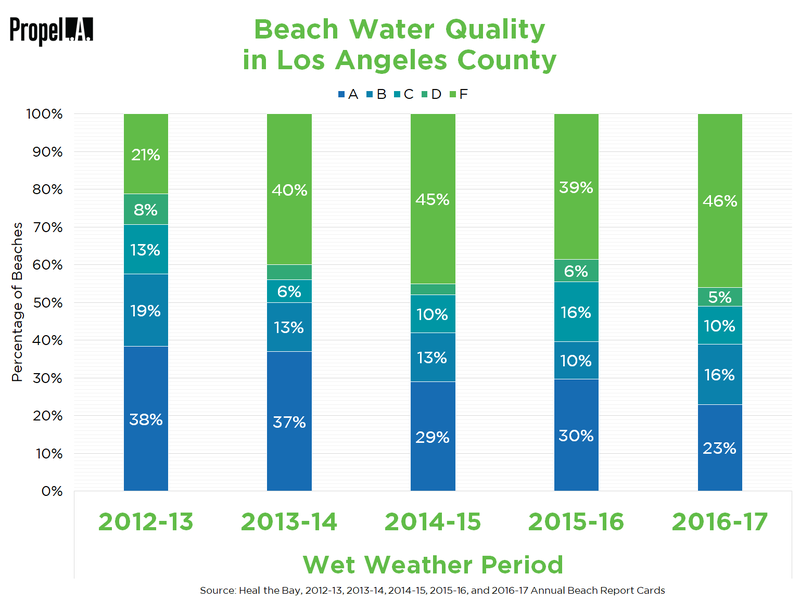 Meanwhile, wet weather grades continue to be an issue in Los Angeles County with, on average, less than half of beaches managing to earn an A or B grade in the past five years. The discrepancy in grades between dry and wet periods can be easily explained. The low grades in wet conditions are attributed to the fact that rain washes pollution from the ground into the ocean. Heal the Bay reported that the recent “record rainfall created billions of gallons of polluted runoff, which poured into storm drains and out to the ocean” (June 2017).